On World Environment Day, Venkatesh Prasad pushes for people to come together to Save Bengaluru! Brigade Hospitality and Signature Club Resort in association with Brigade Orchards today celebrated the World Environment Day by taking an initiative to plant close to 30,000 saplings across the city and their properties. An initiative towards protecting the environment while encouraging people to do their bit to save the planet, patrons and employees from across Bangalore were brought together to be informed and educated about the environment and the importance of sustainable development. 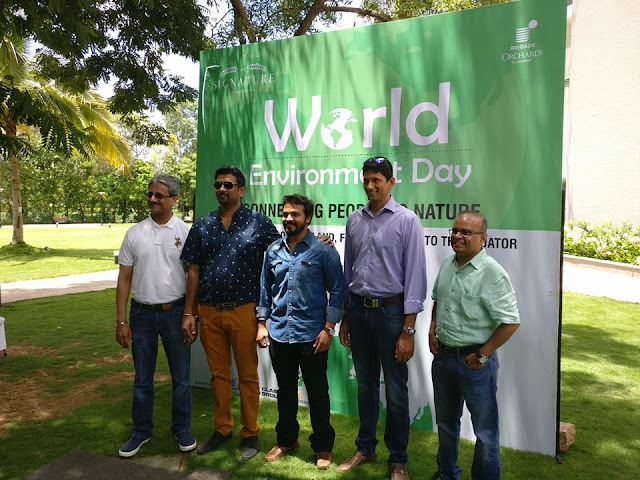 To join the team in celebrating the World Environment Day were Venkatesh Prasad, the former Indian cricketer, and Vijay Raghavendra, a popular Sandalwood actor. The Farzi twist is a Hit! The last time I was at Made in Punjab, I was mesmerized by its silence and no nonsense food. This time I had a chance to visit another favourite from the Massive Restaurants stable- the super famous- Farzi Café. Farzi has been a hot favourite since it opened in Bengaluru. After raving foodies in Delhi, when it opened doors here, you could see that gastronomy was at its best. One had to wait to grab a table and it still remains the same. The food impressive and different. The local delicacies with the “Farzi Twist”. That is when they decided to expand the menu by a bit. Adding more delicacies from the local cuisine in an attempt to connect with the people around. I was invited to try the new menu at Farzi right after the launch of the new menu that had gotten people excited with its sneak peeks (I did some too. Head over to my Facebook to check it out). At the launch party, we got to taste a few of the appetizers but it always is better when you try them out later on. What would you do when your favorite chocolate lounge announces the opening of another store closer to home? Jump at the first opportunity. That is what I decided to do when I was invited to witness the launch of the ITC Fabelle lounge at ITC Windsor. What if I also told you that this meant I got to enjoy a 4- course meal of CHOCOLATE! Insanity? Not probably. Sin? Yes! Heaven? Do I have to answer that? The launch of the lounge brought to us an unique opportunity to experience the chocolate with music. ITC Windsor witnessed a musical evening where guests enjoyed the luxury chocolates in the company of international artistes who weaved magic with music, performing classic medleys, setting the perfect mood for indulgence. The evening saw performances from Polina, the only international cimbalom player in India along with Olga who is a versatile saxophonist from Russia. They were accompanied by Katya, a flautist who can perform a wide variety of musical styles including Jazz, Pop, Funk, Ballads and western instrumental music. Dineout at Hunan! Atleast once! Hunan, the awesome sauce restaurant in the busiest lanes of Koramangala has grown by leaps and bounds in the last couple of years that they have won the Times Food awards consecutively for 5 years in the category for best Chinese food. I was invited right before the end of 2016 to try out the all new menu at Hunan along with Dineout, the table reservation app. The new menu has the best dishes from their earlier menu and the festivals that they have had earlier. TrakInvest Is The World’s First Virtual Social Equity Trading Platform Where Virtual Trading Meets Social Media Via An Easy To Use Desktop And Mobile Interface. TrakInvest Works On A “Learn-Share-Earn” Model, Where Users Earn Real Cash And Industry Internships By Trading With Virtual Currency. By Enabling Risk-Free Trading Of More Than 12,000 Stocks, TrakInvest Helps People Around The World Become More Resilient Investors. TrakInvest Is A Financial Technology Company Headquartered In Singapore With Offices In India, And Has Built Successful Service Partnerships With Leading Global Firms Including Thomson Reuters And Religare.